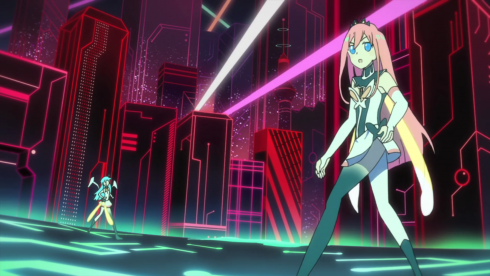 The mecha genre is traditionally associated with male adolescence, so there’s something ever-so-slightly subversive about a world where all of the robots are piloted by girls. It works in the broad sense (aggression and sexual frustration aren’t reserved for one gender any more than cooperation and modesty, after all), as well as a notable marker in Cocona’s growth. 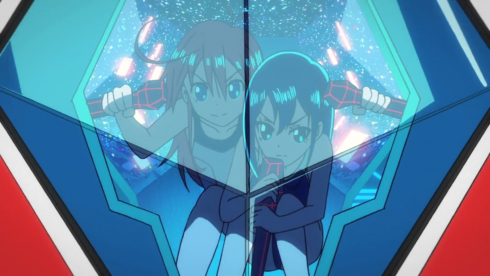 Where our early adventures in Pure Illusion were often focused on the pressures of propriety–especially Cocona’s embarrassment at going “bitey-bite” in the rabbit world and the chaste femininity of the Yuri School–recently we’ve been moving into worlds that are more overtly about transgression. 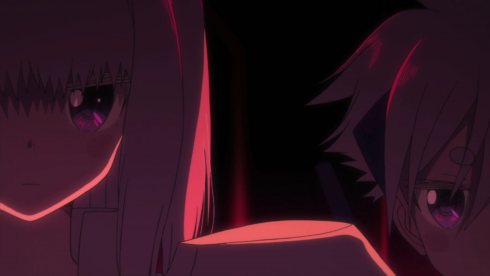 From her string of rule-breaking adventures with the Papieces last episode to her active role requesting “The Power of Rebellion” (as Pops calls it) in this one, Cocona is becoming more willing to challenge societal norms. Good on her. I called this a “bridge episode” in the introduction, which is mostly just to say that not a whole lot of new things happen. Instead, it’s an organic progression of what’s come before, especially for Cocona and Yayaka. Last week Cocona made the decision not to stay locked away in a Pure Illusion with the Papieces. While Cocona still wasn’t sure what she was going to do about Iroha or Papika, she accepted responsibility for her actions and returned to the real world, ready to see what came next. This week, that choice translates into action. 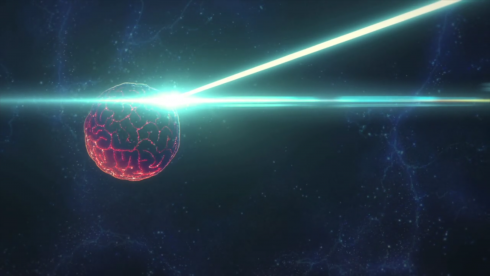 Moved by Pops’s attachment to his creation (and seeing parallels between its destruction and the destruction of Iroha’s paintings), Cocona decides to risk “changing” or “breaking” things in order to save something else. As Pops says, just surviving isn’t enough. For life to have meaning, you also have to be willing to fight to protect what’s precious to you, whether that’s a city, a painting, or a relationship. While Papika’s role this week is mostly to support Cocona’s choices, Yayaka is also at a crossroads. Her position in Asclepius is shaky, and there’s no love lost between her and the twins. We’ve also seen how much she cares about Cocona, and how Cocona and Papika’s almost compulsive loyalty and kindness (Papika didn’t have to save Yayaka in the Yuri School, but she did it without a second thought) surprises and changes Yayaka, too. 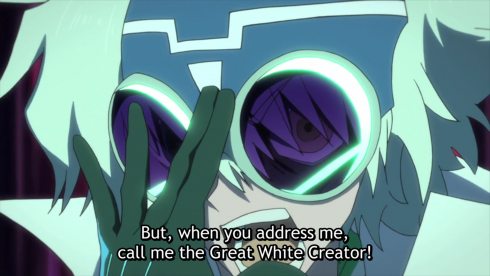 With all that built up quietly behind us (the character growth in Flip Flappers is really very good), “Pure Breaker” has it all come to, well, a breaking point. 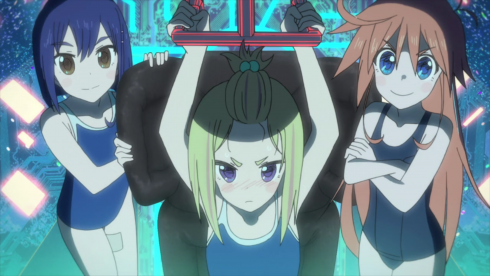 Despite Yayaka’s best attempts to be distant and professional, her bond with Cocona (and possibly Papika) is stronger than her dedication to Asclepius. When they need help, she helps them, even if it jeopardizes her mission to collect the amorphous. As happy as I was to see Yayaka overcome her embarrassment and release her own impedance, Flip Flapping the team to victory, the way the twins watch her does not bode well for future episodes. I’m worried for our resident tsundere. There’s one other character who gets a lot of focus this episode, although it’s not quite as obvious as the others, and that’s Bu-chan the Pervy Robot. 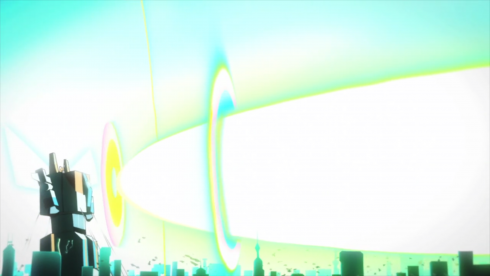 Much like when Uexkull went through the portal first and became the chief architect of the rabbit world, Bu-chan’s umwelt (self-world) forms the foundation for this one. 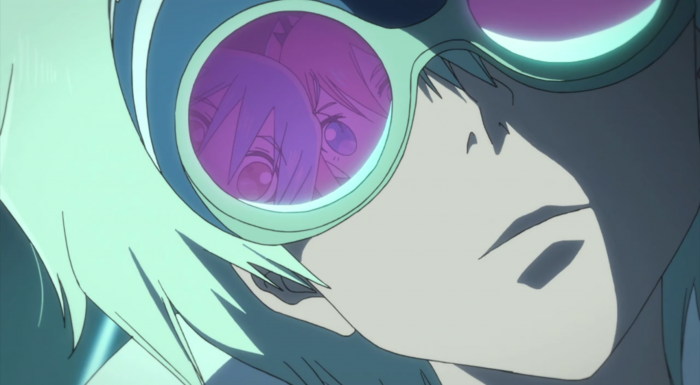 As with Uexkull, this means we get to see Bu-chan as he sees himself–not as a robot communicating in fragments, but as Pops the tiny human inventor. 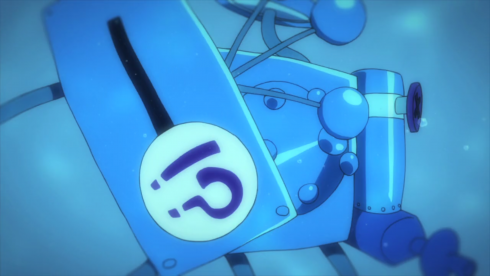 We’re never explicitly told that Bu-chan=Pops, mind you, but there are hints throughout the episode: The robot’s complete absence, the similar nicknames Papika gives the robot (“Bu-chan”) and Pops (“Occhan”), Pops’s multicolored eyes and height that match the robot body’s perspective, the way the world resembles computer circuitry, the brain-planet…hell, even those unpleasant angles in the robot cockpit (which were too awkward to be proper fanservice but also too invasive to be silly, meaning they were just uncomfortable and out-of-place) speak to Bu-chan’s own leering gaze. Bu-chan has never quite fit into the world of Flip Flappers and I’ve generally considered him the weakest part of the show. 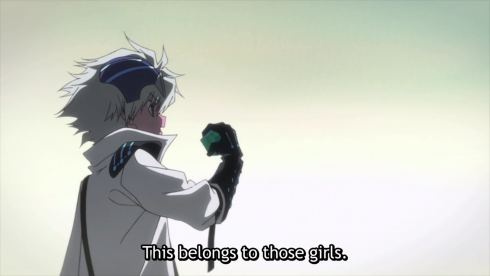 His ogling doesn’t mesh with the tone of the series (I guess you could argue he’s another example of repressed sexual energy, but it’s still creepy) and he doesn’t do much beyond sometimes helping with portals (although it’s also implied that Hidaka uses him to collect data on Cocona, Papika, and Pure Illusion). That said, while “Pure Breaker” doesn’t perfectly justify Bu-chan’s existence, it does give us a vital glimpse into his inner workings and provides us with, if not exactly answers, then maybe some foreshadowing. 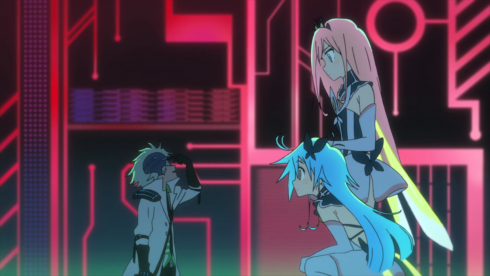 Pops is full of himself and prone to melodrama, but he’s also a brilliant inventor who’s passionate about the computer-like city he’s built around himself and seems to genuinely care about Cocona and Papika. Given Pops’s desire to keep the city (a.k.a. 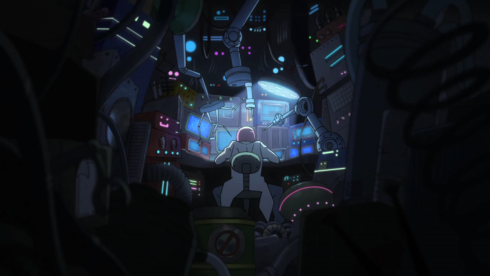 his mainframe) intact, the fact that his HQ is almost an exact replica of Hidaka’s own cramped, cluttered lab, and that Hidaka seems genuinely frantic to maintain Bu’s “old model” robot body, there’s a good chance Bu was once a FlipFlap scientist who worked with Hidaka directly and helped build the robot body where his brain now resides. 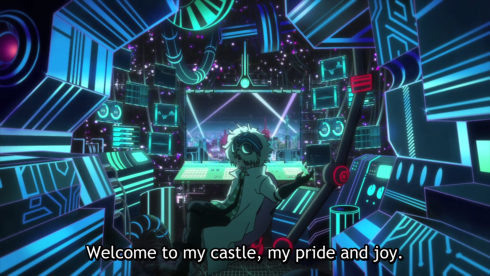 Now that body is in danger–Hidaka laments that he’s running out of spare parts, a hard truth echoed in Pure Illusion by the monsters that keep threatening Pops’s city. Isolated, trapped between a human image of himself and a mechanical world, and under constant attack, Bu-chan’s umwelt outside of his “castle” is full of harsh lines, dangerous reds, and despairing blacks. He’s dying and he knows it. The gals may have saved his city today, but I doubt they’ve saved it forever. 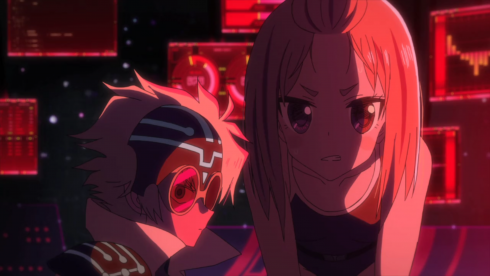 It’s hard for me to muster much sympathy for a robot that leers at teen girls, but the figure of Pops bent over his computer, desperate to save his creation or demanding to know how Yayaka truly feels about the other girls, certainly does a lot to humanize him and even grant him a kind of tragic dignity. There’s always been an aura of darkness hovering just around the corner of both FlipFlap and Asclepius, and this week’s Pure Illusion speaks to that. 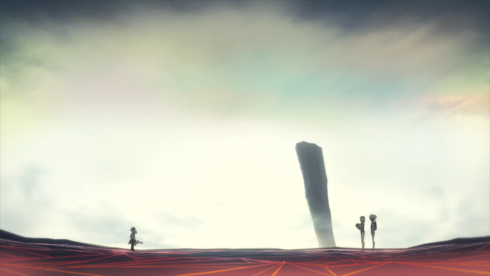 Hopefully it’s also setting the stage for some backstory and answers, especially where the amorphous, Dr. Salt, and especially the mysterious Mimi are concerned. This bridge episode was a busy one. Now it’s time to cross it and see what our third and final act has in store for us. 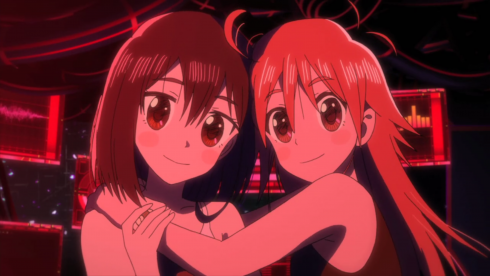 I need that Flip Flappers Action-Packed Insert Song post-haste. NEED, I say. “It’s too small.” “No, you’re just too big,” Perspective is always at play in this show, even in the little touches. 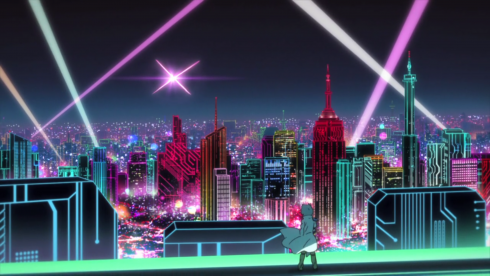 Note that Pure Illusion leaked into the real world again: Bu-chan’s robot body took the same damage the city did, and he collapses in Hidaka’s office in a pile of smoke. 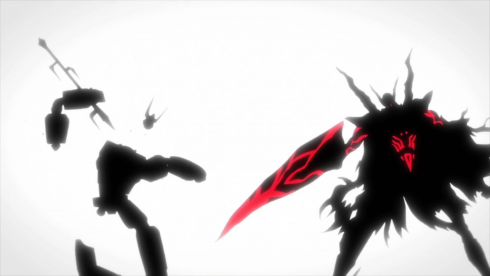 While I have a working knowledge of what mecha stories often do, I confess it’s not my favorite genre and I haven’t actually seen that much of it. 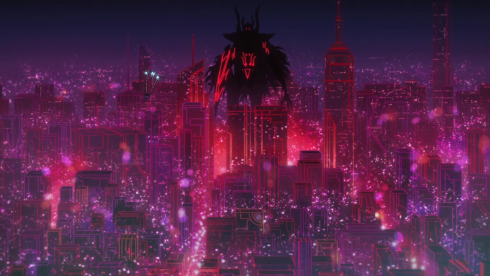 I have a feeling this episode was full of little homages, but beyond a few obvious ones (the linked-up super mecha, the truck turning into a robot) and visual cues (the monster somewhat resembling an Eva mech), it flew over my head. If there are other cool things happening with the genre this episode, I’d love it if you’d let me know in the comments!